Performance Automatic's 01-04 Mustang shift kit will give you the shifts you want, after just a few hours of work. Your Mustang's automatic transmission's main focus is smooth shifting between gears. To accomplish this it often goes into two gears at once while shifting up, which is known as a shift overlap. 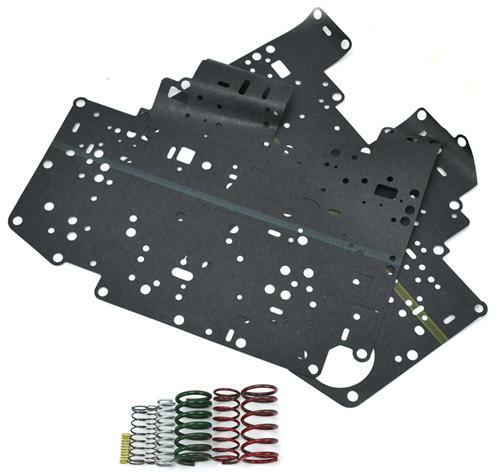 To reduce or eliminate the shift overlap you will need to install a shift kit in your Mustang. Shift improvement kits not only improve performance but they also reduce wear because the transmission won't be trying to drive in two gears at once. You want two things from any shift improvement kit, easy installation and positive shifts. Here they are, look no further for the tire chirping shifts and performance you can count on. Performance Automatic has researched the best shift modifications in the business and brought together the best there is. 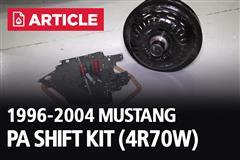 This Shift kit fits 2001-2004 Mustang GT's Equipped with the 4R70W Automatic Transmission. Performance Automatic has been delivering the ultimate in high performance transmissions, torque converters, and the related drivetrain components. Their countless hours spent on research and development allows for the production of some of the best drivetrain components on the Mustang market. Your Mustang's automatic transmission's main focus is smooth shifting between gears. To accomplish this it often goes into two gears at once while shifting up, which is known as a shift overlap. To reduce or eliminate the shift overlap you will need to install a valve body kit in your Mustang. Shift improvement kits not only improve performance but they also reduce wear because the transmission won't be trying to drive in two gears at once.